McDONALD COUNTY REAL ESTATE, SERVING ,MISSOURI, OKLAHOMA, McDONALD COUNTY, MISSOURI, BARRY, NEWTON. We are located on the corner of Peacock Lane and Hwy. 71… just across from the Jane Wal-Mart at one of the busiest intersections in the county. One of the first things you notice about our location is the tall scrolling marquee’ which informs passers-by about various listings which are available in the area and viewed by thousands daily. O’Brien Realty is members of 2 multi listing system giving your listing exposure to 5000 agents. Our listings are also on Zillow, Realtor.com, Trulia to name a few. Along with these site we also advertised on LandsofMO, largest rural listing service in the Nation and powered by LandsofAmerica and on Landwatch, another top land search site. You can also find us on Facebook. 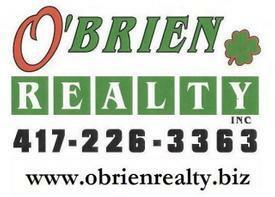 Visit our website, www.obrienrealty.biz or stop by and see us. We pride ourselves on being a member of 2 Real Esate Boards. In addition, we belong to both the Oklahoma and Missouri MLS systems which gives clients' property listings double the exposure they would receive elsewhere.